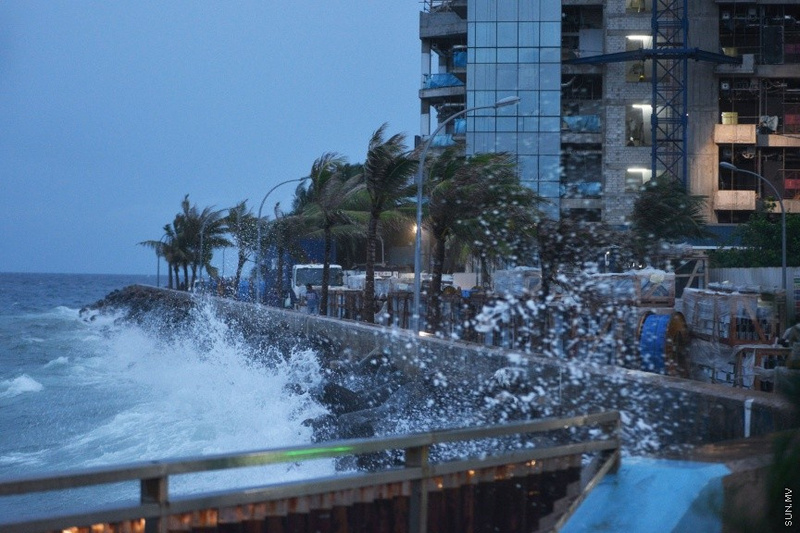 Maldives Meteorological Service forecasts the bad weather affecting Maldives to continue over the next 24 hours, warning everyone to be extra vigilant. Meteorological Service has issued White Alert to islands in H. A. Atoll to L. Atoll from 9:30 am to 3:30 pm this Monday. The authority forecasts average strong winds of 23 to 29 miles per hour with gust winds of 45 miles per hour, as well as rough seas for the region. Meteorological Service forecasts bad weather across the country from 10 am this Monday to 10 am next Tuesday. It has forecasted scattered showers and few thunderstorms in Northern and Central atolls. And a few thundershowers in Southern atolls. Surface winds will vary West to North-Westerly at 17 – 27 miles per hour in Central and Northern atolls, South-West to Westerly at 15 – 20 miles per hour elsewhere. Winds may gust 50 miles per hour during showers. Seas are expected to be generally rough in the Central and Northern atolls, and rough becoming generally rough during showers in the South. The authority has warned all parties, especially sea travelers, to be extra vigilant and take all necessary precautions. Meteorological Service has also warned of possible swell waves during high tide.